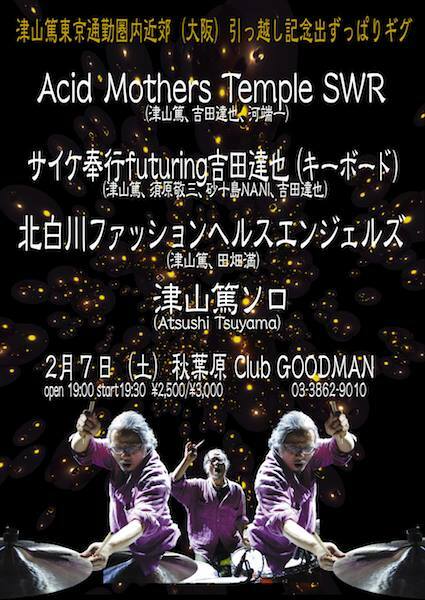 Tsuyama Atsushi Housewarming Anniversary Special Gig! -For this special evening, 4 acts with one common thread: Tsuyama Atsushi being on stage restlessly! This first part includes AMT SWR & Kitashirakawa Fashion Health Angels. Second part includes Tsuyama Atsushi solo & Psyche Bugyou feat. Yoshida Tatsuya. A great evening full of psychedelic music and funny speeches, AMT fans will most likely enjoy this. -AMT SWR played first, shortly followed by Kitashirakawa Fashion Health Angels. Then after a 30 minutes break, Tsuyama Atsushi played a solo set directly followed by Psyche Bugyou. AMT SWR played early because Kawabata performed another gig with Andromelos2 the same evening in a different venue in Tokyo. -Good to very good sound. Slight equalization applied and a buzzing noise on the right channel during AMT SWR set has been removed. Club was not that packed so there is no audience noises except for cheers and laughs. NOT FOR SALE / SHARE IT FREELY!